As a good Take A Friend To the Orchestra exercise, I could probably convince 10 friends to buy tickets to experience a night at the orchestra for the first time in their lives. But as the Oliver Wyman’s Audience Growth Initiative study shows, about nine of those friends probably won’t return the following year. The big picture: contrary to popular belief, orchestras do a pretty good job at bringing new people into the halls, but they have a great difficulty retaining them year on year. The churn rate for the “core audience,” or patrons who have attended numerous concerts for many years, on the other hand, was only 10% (and if I may callously speculate, that’s probably because they died!). The revenue, including both sales and donations, difference between the unconverted trialists and the core audience over five years is significant: $199 against $4,896. itself is the experience, whereas for the unconverted trialists, everything is the experience. These trialists expect a seamless end-to-end experience. We can broadly distinguish three core stages of the end-to-end experience: the courting and purchasing process, the event itself, and the follow up. Let’s look at the way orchestras have long brought in new patrons and how they have treated those patrons at and after the concert. 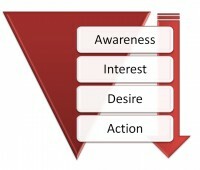 The long-established model of marketing, explained by the acronym AIDA, takes the shape of a funnel. 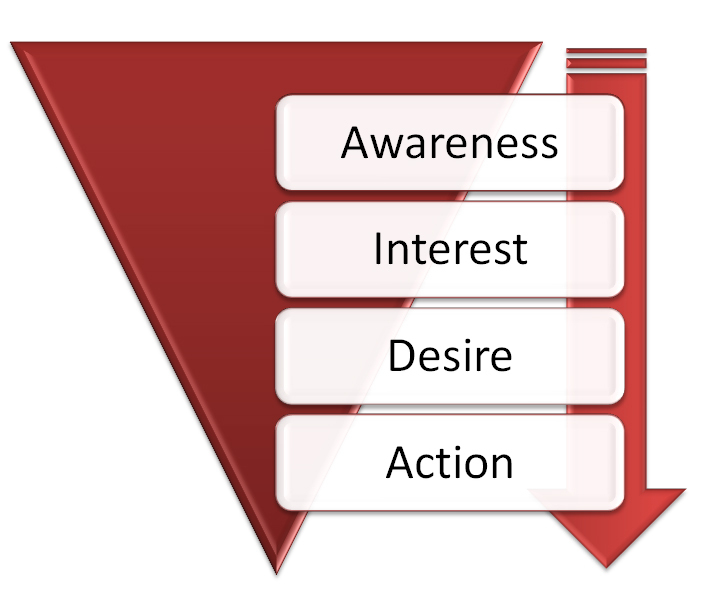 At the wide top of the funnel, organizations throw a lot of money at an extremely broad audience to attract attention and generate awareness (A). Then, they spend a bunch of money to get those who are aware of the product interested (I) in the product. A lot of effort is put into making those who are interested believe the product will satisfy their specific needs, so that they desire (D) the product. And lastly, those desiring potential customers finally take action (A) and make the purchasing decision. In short, a costly process of weeding out the uninterested and unresponsive; a labor-intensive process of guiding a large group of potentials through a narrowing funnel to end up with a small group of ticket buyers. After the courting process and the purchasing decision, a myriad of variables frame the concert experience for this small group of ticket buyers. It’s not just about a great, inspiring performance by the orchestra. It’s also about the easy parking process, the great dinner options before the concert, the friendliness of the will-call box office staff and the ushers, and yes, even the friendliness of the fellow concertgoers. As you can see, some of the variables are somewhat beyond the control of the organization. What can you do, for example, when a grumpy long-time patron chews off a newbie’s head when clapping too early? Just as the customer experience doesn’t begin with the concert, it doesn’t end after the concert either. The customer experience is the total sum of any point of contact of the customer with your brand. From an ad in the paper to the ticket agent on the phone, from the purchasing process online to the parking and dining options, from the music to the fellow concertgoers, and from the line at the bar to the follow up by telemarketing, telefunding and direct marketing campaigns. And how you follow up is very important. We all know the stories of people who went to one concert and were bugged or begged only a week later to purchase expensive subscription packages or donate an exuberant amount of money. Not to mention the storm of direct marketing mailings they will start to receive. I can’t help but think the following is a very typical story at orchestras across the country. In my first year of working at an orchestra, I contributed $150 to the annual fund through an employee initiative. The following year, I received a phone call from a representative in the telefunding department. The poor representative, who was following a written script, had no idea he was calling someone inside the very same building, someone who was working for the very same orchestra. But here’s the kicker: he was asking for a $1,500 donation, an amount 10 times greater than what I donated a year prior! Our goal then is to turn unconverted trialists into active Take A Friend To the Orchestra organizers (and not just one time in April). Let’s start with actually flipping the funnel. Jaffe does this by turning the acronym around—ADIA—and coming up with a new meaning for the four letters. No more blissfully unaware audience as a starting point. Jaffe starts with acknowledgement (A) after the purchase. He lists several ways. First and foremost, a simple thank you is very powerful. Then there are progress reports (“since you placed your order, the price has dropped, and the difference will be applied to your account”), courtesy check-ins, follow ups and reminders. The point of all of these is not to sell, but to enhance the customer experience (of which customer service is only a part). Remember the grumpy, long-time subscriber that attacked the newbie with a cane earlier? (Okay, I’m exaggerating. Barely.) The newbie probably won’t know to go to the house manager. But what if there is a proactive courtesy check-in by an orchestra representative during intermission? “How’s your concert going today?” Customer service is proactive, not just reactive. 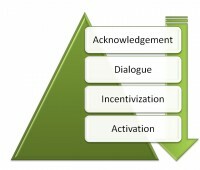 After the acknowledgement (A), there is dialogue (D), and increasingly, this dialogue takes place online. Already in 1999, the ground-breaking Cluetrain Manifesto told us that markets are conversations. Traditionally, organizations only talked to people. But people are talking out there about you in public—on Twitter, on Facebook, on blogs, and for orchestras on sites like Dilettante and InstantEncore—and you can’t ignore what’s being said about your brand, even though you can’t control it. Now manipulation calls to mind horror images from Soviet propaganda, but for our purposes it really just comes down to advertising, public relations and sales. Respected social media author David Meerman Scott talks about three traditional ways that companies talk to people: they buy attention (advertising); they beg for attention (public relations); or they bug people to get attention (sales). But there is a better way: you can earn attention. And that’s where social media comes in. Over the past decade, the Internet has moved toward becoming a social medium with more participation (encouraging contributions), openness (no barriers to content and feedback), connectedness (networked relationships and sharing content), community (gathering around a common interest), and, of course, conversation (a two-way street). 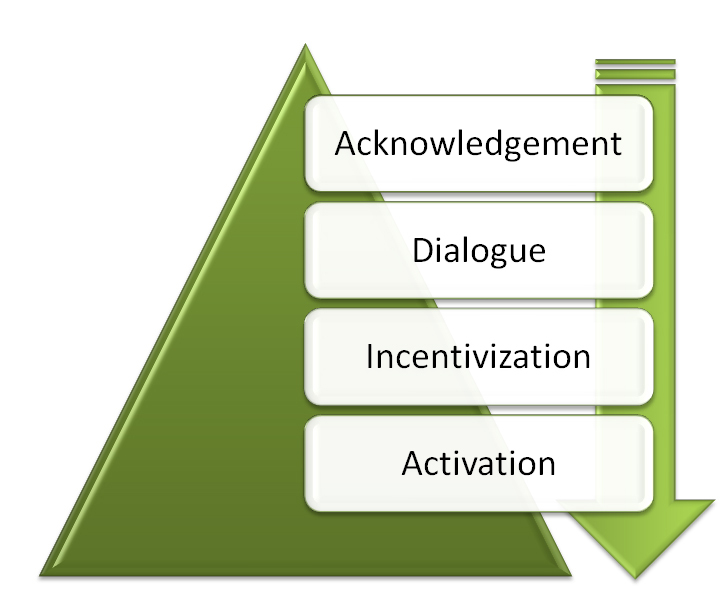 And so after acknowledgement (A) and dialogue (D), we move forward to incentivization (I). The Wyman study identified various factors that influence customer behaviors, including the core product—the musical experience—as well as music enhancement (information and commentary); access (parking and public transit); social experiences (meeting friends and meeting the musicians); and transactions (purchasing process and exchange options). The study found that offering unconverted trialists certain “killer offers,” where there is an optimal combination level of attributes (this may include incentives like buy-on-get-one-free, free parking, free drink at the bar, free exchanges), see a much higher response rate. Wyman recommends this use of finely tailored promotional offers to sell another single ticket or two to unconverted trialists before asking for a commitment. In other words, invite them on a couple of dates before going steady (subscriptions) and eventually popping the question (donations). And don’t forget to reward your core audience. Jaffe warns against slapping existing loyal customers in the face by heaping endless discounts and perks on new customers. And you know what? Your loyal core audience has been playing Take A Friend To the Orchestra for years. Jaffe speaks of rewarding those who are inclined to talk about you and recommend you to others, so that they don’t feel like being taken for granted and so that you might increase the probability of the number of recommendations. Word-of-mouth recommendations are strong influencers, so why not make it easy and worthwhile to spread the word? The last part of the flipped funnel, where the funnel is at its widest, touches communities and social networks and the activation (A) of advocates. Jaffe writes that the role of marketing in this part is “to ignite activation.” It’s all about a technological framework and organizational process supporting a new customer-centric ecosystem. It’s about allowing customers to be advocates and evangelists. Think about the Leukemia & Lymphoma Society’s (LLS) Team In Training program, which has raised more than $1 billion over the past two decades. LLS excels in igniting advocates with their sports training programs that turn athletes into fundraising machines. LLS has put a technological framework (personalized Web pages for participants) and an organizational process (staff and clinics to help participants) together that allows and facilitates the participants to become LLS evangelists. Now, unless you have a significant amount of money and join an orchestra’s board of trustees, there are few options for people to activate their communities and networks on behalf of orchestras. Referring back to the terms participation, openness, connectedness, community and conversation I mentioned earlier, perhaps the volunteer office of the 21st century can provide the organizational process to facilitate the activation of 21st century advocates through a social and technological framework, including, but not limited to, social media tools like Facebook, Twitter and customized online communities. And if we’ve learned anything from the past, we know that this framework of activation can go a long way toward putting a candidate in the White House. And there we have it; the flipped funnel. It might come as no surprise that Seth Godin, one of the most popular and best-selling marketing authors today, thinks of the funnel as a megaphone. It’s not about funneling down from many to one, but rather funneling from one to many; turning your customers into evangelists. But you can only achieve this when you have an impeccable end-to-end customer experience with customer service as a strategic driver. You can only achieve this when you realize, as the authors of the Cluetrain Manifesto did more than a decade ago, that “markets consist of human beings, not demographic sectors.” You can only achieve this when you are engaged with and within your community, online and offline. The only way Take A Friend To the Orchestra can be effective is if those who are taken to the orchestra return time and time again. Above, you have read how orchestras can make sure they not only return, but establish a continuous circle of friends taking friends to the orchestra. Read Marc’s bio and more at the TAFTO resource site.